Accessing your side dishes and desserts is effortless with this 1/3 size steam table pan cover. Keep your food enclosed with this lid to ensure that your guests always dig into something steamy. Opening and closing is also made easy with a flat, center handle. Preventing heat from escaping, this lid will protect your most popular dishes from going cold. Whether you are catering a birthday, barbeque, wedding, or accommodating any hungry crowd, this lid will keep your dishes hot for hours and withstand years of use! This 1/3 Pam stainless steel steam table pan cover is surprisingly good. Made of good metal. Although it is rated standard weight, you will be happy with the quality. 1/3 pans are pretty rare in our establishment, which is why I was so happy to find a site that I could purchase just one at a time on. It helps keep costs down! the 1/3 stainless steel pans are great to help keep your steam in on your steam table. A quality pan lid can make a big difference in the quality of your food. This Choice 1/3 size stainless steel solid steam table pan cover is perfect for the pan we purchased. It fits great. These are easy to clean also. Have purchased many of them. I am really please with this product and I was happy with how it works with the hotel pans that I had bought previously. They work great. We ordered 5 of these. They arrived in prefect condition with no bends or warps. We have been issuing them daily and they work exactly as described. heavy weight lid sits well in any third pan. It wont get dinged up corners through normal use as it's pretty thick steel. The product works as is intended. If you have 1/3 size hotel pans do yourself a favor and get these covers. They fit the pans very nicely and allow for stacking. Very nice quality and durability. Fits perfectly on our 1/3 size hotel pan 6" deep. Helps to keep hot items hot and covered for future use or even to keep things refrigerated. These covers are essential for keeping our sides hot on the steam well table. It fits the 1/3 pans well and helps us organize and stack our sides in our cooler and hot hold unit. Great quality and a great price. You can never have enough pans and lids and at the price, it never feels like a waste of money when we have to purchase more. These fit the Choice 1/3 size pans wonderfully. Very solid product at a reaonable price. Stock up on lids and save money on foil. Much easier to handle when checking foods while cooking. These are perfect at covering 1/3 hotel pans. They fit well, are hard to damage, and are exceptionally easy to clean and hard to stain. These lids do what they're supposed to do. The price is right. they are easy to grab & materials used look like they will last a long time. Great value. Line pan covers do exactly what you'd expect keeping food safe from outside air and keeping heat inside. Sliding middle ports open to allow steam to escape. We use these lids to cover our 1/3 pans in the steam table. We'll normally pop the lids on before our doors open or when things are slow so that the food retains heat and moisture better. Great stainless steel Steam Table Pan covers. We are using these to cover out toppings at our yogurt store. Great option to keep our products fresh and cold. This lid fits well and keeps the moisture in the pan. It is nice and sturdy and was a very good price to pay for the product. easy to use lid to cover up food. So its your basic lid for all your food needs very durable stainless pan cover, very happy. These worked great with our steamer and steam trays. There is a lot of condensation created when these are in use so we tried to leave a small gap. The Choice 1/3 Size Stainless Steel Solid Steam Table/ Hotel Pan Cover is a great quality pan cover. It fits well on a 1/3 size pan and it is very durable. It can be placed in a dishwasher and the price is great. I will be purchasing more of these. Great Product . we use this cover with steam table pans a lot and they are really good quality and easy to clean and the price is really unbeatable . I love these steam pan lid as a way to make sure that you follow the food code. Pair with washable labels for a breeze cleaning. Very inexpensive stainless steel steam pan cover. Just as good as the more expensive ones that we have bought in the past. Dishwasher safe so very easy to clean. These covers work and fit well. No complaints from our kitchen, and are a must have for your hotel pans. Will be ordering more soon! Lids for containers are a great idea to prevent insects. This lids fits perfect very durable material washable and nsf. Very good price. Good product. These lids are perfect for keeping in moisture on our steam table. They fit snugly on our 1/3 size pans and they are very sturdy. I doubt they will ever need to be replaced because of wear. We bought the matching choice 1/3 size stainless steel pan covers to go with our pans. They fit perfect and keeps every thing warm or cold as we need. These seen more like heavy duty than medium. The fit snup and don't dent or bend when dropped. Stacking multiple pans on these is not a problem. Great cover that's also a great price. We watch all of our pennies and these brands are a great choice to help your bottom line. The covers works great and keeps the food within the correct shelf life. The price is unbelievable and the shipment turnaround time is one of the fastest that I've seen. Great lids for steam table or storage of food. The only drawback is that these have a bulge on the underside, underneath the handle, which requires you to keep an open space inside if you want the lid to stay closed. Like the other covers that I bought here, this product meets with my satisfaction. The size fits comfortably on the compatible sized pan. The quality is firm and of good value. Good buy!! High quality product that keep food warm. These lids fit perfect as long as they go with the corresponding pan. I have a variety of lids and have had no issues with none. Great lid at a great price. Super durable and easy to clean. fits all of my 1/3 pans perfectly. I'll brogue chasing more of these in the future. The 1/3 size steam table pan cover was purchased to go with the corresponding hotel pans. We are pleased with the fit and quality of the product and the cheapest we have been able to find them. Great pan lid I have many of these. The price is low and th quality is high just how I like it. They fit perfectly on a 1/3 pan with very little wiggle room. These steam table pan lids are great for keeping food warm and covering items on the steam table in the kitchen. We use them in the hot food bar prior to it opening. great strong tops for all of my hotel pans. They fit nice and snug on the corresponding hotel pans, are easy to clean, and are tough and durable. These are standard sized, good quality hotel pan lids. Webstaurant offers the best pricing compared to other stores. I recommend them and definitely would buy again. We use a ton of 1/3 size pans in our steam table and these are fantastic for keeping food hot (and without drying out!) during the day. They also make these pans easy to stack when storing at night. These lids are great for storage as well as moving the 1/3 pans from place to place. They are much easier to stack with the lids. Once again webrestaurantstore had the lowest price out there for the 1/3 stainless steel pan covers. Fits perfectly with the 1/3 pans I also bought from them, I highly recommend this to everyone! This is a simple product that has great use in a restaurant or if you are catering an event. It is made of stainless steel and is extremely easy to clean. It sits comfortably on the partnered pan. Storing them when not in use is easy because they stack. We use these lids to keep our soups warm in the water bath warmer. They are easy to keep clean. They do the job which is intended of them. The price is great! Will be ordering a few more soon. We love these pan covers. I have bought several hundred in the last 3 years. They stand up to shipping and constant use. Is is a good price compromise to the USA made one. These tops are a must to be used in conduction with the pans and its a money saver too instead of having to use foil. Great pan cover. It fits tightly and just like the pan this feels like a very durable cover. Will purchase more when I get more pans! Good value. Strong durable covers at a better price than other online sources. I converted a couple of my 1/6 pans on my salad prep to 1/3's and both the pans and covers on webst are better price than elsewhere. We purchased these to complete our prep table. Inexpensive but yet so needed. Would buy them again. I didn't expedite but delivery was super fast. Standard weight lid to go with standard weight pan. Good pan for price, solidly built. For the price it's really hard to pass this up. Great easy to clean solution for covering your pans, and at a great affordable price. We own about a dozen of these, and will buy more in the future. I use this pan cover to cover my hot dogs that are steaming. It does a great job keeping all the heat inside the pan. Very easy to clean! Very please with what i got an matches my Hotel pans perfect. Came to me with no dents and happy to have done business with you guys. Bought these to complement the pans purchased to serve prepared soup out of and am happy with the purchase. If using for soup, I would recommend getting the ones with the cut-out for a ladle which I purchased later. These solid lids without spoon notches are nice for holding the moisture in your foods - this lid is a great price and works great. Seems like we can never have enough of these lids. Best price around for them too. Product is just as described, they hold up well with daily use. Great item for the price. 1/3 solid steam table covers are very great for keeping food hot without having to use foil or even plastic wrap! Very durable and easy to clean. I will be ordering more for me or as a gift. Highly recommended this product. Lids get the job done for the right price. Not as quality of stainless steel as Vollrath or other name brands, but work well as intended. Simple product, looks great and holds up well. many uses for this. But in the end its an inexpensive sheet tray that is not a cheap product. You can never have too many pan lids! These fit our variety of 1/6 pans just fine. No issues with different manufacturers. Quality is not extremely heavy duty but I think they'll be fine as long as the staff doesn't bang them around too much. the lids fit perfect with everything, i will be buying alot more of this in the near future. thank you so much for the great customer service. they mde it all happen for me. This fits perfectly with the pan I purchased. I looked for a long time to find this and really like it. It works great in my hot dog cart. The cover is very durable, it works well on the pan and serves the purpose really by keeping the food warm and also bugs out of the food. love it. 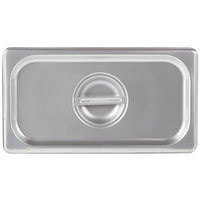 This 1/3 size steam table pan cover is sturdy and great quality for the price. Fits most brands of stainless steel 1/3 pans and is perfect for hot or cold applications. Washes up beautifully and always looks brand new!